Wonder Woman is here! She is here after so many years of waiting. Fans of the demigod can see her on the big screen up against the big boys and she makes that stand. After mixed reviews from previous DC films from us, other critics, and fans, we were worried about this one. I’ve held neutral feelings towards it, not wanting to get my hopes up, but then when then glittering reviews made their way through the internet and then seeing it for myself, it was what I hoped for. While not a perfect film, it captured the spirit of the source and held up with other superhero films that make them memorable for me. Wonder Woman opens with Diana in present-day after the events of Batman V Superman: Dawn of Justice. A courier from Wayne Enterprises brings her a post World War I photograph. She then regales her tale to the audience. Diana is Princess of Themyscira, an island of Amazon women that the gods created to protect mankind. Ares disagreed with the making of Themyscira and killed all of the gods. Zeus put a stop to him, and cast him out from the mountain, leaving a sword to the amazons capable of killing Ares if he returned to the island. Diana’s mother, Queen Hippolyta believes he will return and forbids her from warrior training like the rest of the island. Fortunately for Diana, her aunt, Antiope, thinks she should train and does so in secret. Being a child, it doesn’t stay a secret long and Hippolyta relents. One day a pilot breaks through the barrier and crashes his plane into the ocean. Diana dives in after him and saves him from drowning. It’s not long before German troops come through on their cruiser and soldiers dock to pursue the man Diana saved. The Amazons fight the invaders and kill them all, the man Diana saved aiding. Antiope sacrifices her self to save Diana from a rifle shot. When the battle is over, the Amazons take the man and wrap him with the Lasso of Truth. He reveals his name is Steven and he’s an allied spy in The War to End all Wars. He’d stolen a notebook from a Spanish chemist containing the information of a deadlier mustard gas under the direction of General Ludendorff from the Ottoman Empire. Believing only Ares could bring on such a war, Diana insists Steve take her with him to fight. Diana takes the god sword and shield and, with Steve, takes a boat through the barrier into the outside world. Diana and Steve arrive in London and take the stolen notebook to Supreme War Council. The notebook contains a language nobody can read, except Diana. She translates the text and reveals that Ludendorff plans to release the new gas bomb at the warfront. Still believing this to be the work of Ares, Diana insists on going to the front lines to attack, but the commanders laugh and forbid it. Undeterred from her goal, she vows to go anyway, and Steve and his conscious and personal morale can’t let her go alone, so he rallies together old war buddies and travel to the front lines in Belgium. Once there, Diana dons her Amazon armor and shield and storms across No Man’s Land. She alone destroys the enemy forces with the allied forces behind her. They celebrate in a small village for the night. From their commanding officers, they receive word of a gala happening. Diana goes with the intent to kill Lundendorff, and Steve to locate the gas. Diana nearly blows their cover, but Steve stops her in the nick of time. She follows after Ludendorff’s getaway a getaway platform outside Veld. She kills him and the gas still releases and kills all in the surrounding village. Ludendorff wasn’t Ares after all?! Sir Patrick from the War Council suddenly appears and reveals he was Ares, purposefully leading Diana to the battle. He tells Diana that his existence doesn’t cause war, that humankind is corrupt from within, all he has to do is give subtly to an idea and humans destroy each other. Ares breaks the godkilling sword and reveals that Diana herself is the godkiller, a demigod, not born of clay like she revealed, but born of Zeus and Hippolyta! While Diana fights Ares, Steve and his team destroy the lab and all ingredients for more gas to be made and the reserves of the main gas. unfortunately, a loaded plane is on a time bomb. Steve bids farewell to Diana and takes off in the plane so it can explode in the sky, away from victims. Overcome with grief, Diana regains strength and delivers a blow with her gauntlets and kills Ares. Back in present day, Diana sends an email to Bruce, thanking him for finding and sending the photo, thinking fondly of her lost love and her affirmations to be Wonder Woman. Wonder Women is the ray of sunshine with in the Snyder-verse and it was very much needed. It was light-hearted and rooted within the real world, giving off a Captain America vibe. And I mean that in the highest praise as Captain America is my favorite avenger, and his first film had perfect tonality. Having roots in our world history and characters of similar moral fiber help in that regard. 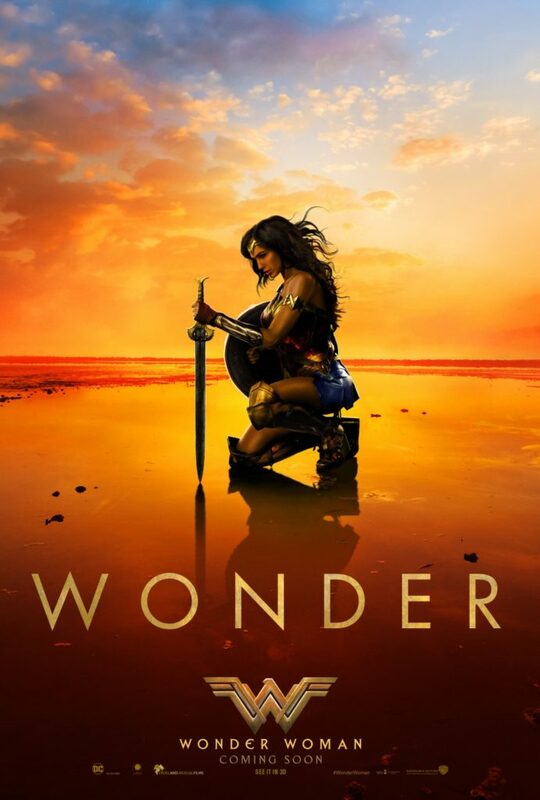 Being directed by a women, fans of comics and superhero movies were skeptical, and maybe they still are out of stubbornness, but Wonder Woman was just as good as anything Marvel has put out in the last ten years. I appreciated the lack of The Male Gaze. The only type of fan-service you could consider as such is you see her thigh giggle in a landing pose. The feminism wasn’t heavy-handed as Diana is generally confused by gender roles as a whole. The violence was incredibly subtle, despite being about war – no blood or grotesque violence, other than gas poisoning. Crude humor was nearly absent. Beautiful score by Rupert Gregson-Williams. Lovely costuming of the Amazon warriors and imagining of Themyscira for the screen. The weakest parts of the films were what Diana’s powers actually were and Ares. She has the gauntlets like she should, but it was inconsistent of them being amplifiers/deflectors or could shoot light from them? Can she fly or is it just jumping really far? David Thewlis as Ares worked as a disguise, but when he didn’t shift out off that for it was difficult to take seriously. I commend casting for not going for a stereotypical beefcake, but he felt unthreatening and a little ridiculous. My hope is that Wonder Woman stands as an example of audiences wanting to see a female superhero film and that female directors are just as capable of writing compelling action. I anticipate much success in the box office due to the anticipation and word of mouth. Not a perfect film, but it is a step in the right direction in the sense of movie making and representation of women in a positive light.